Check out Roman Reigns‘s WWE profiles here! Joe Anoa’i is the son of WWE Hall Of Famer, Sika, the nephew of Afa and the brother of Matt Anoa’i aka Rosey. 2006: Joe Anao’i was a first-team All-ACC defensive tackle at Georgia Tech in his senior year. After going undrafted in the 2007 NFL Draft, Joe Anao’i was signed by the Minnesota Vikings franchise. ~~~Upon being released by the Vikings, he was signed by the Edmonton Eskimos of the CFL (practice roster). Joe Anoa’i was expected to make the jump to the NFL but did not make it due to an injury. July 2010: Joe Anoa’i signed a developmental contract with World Wrestling Entertainment. September 9, 2010 – FCW: Richie Steamboat defeated Roman Leakee. September 15, 2010 – FCW: Idol Stevens defeated Roman Leakee. September 15, 2010 – FCW: Wes Brisco defeated Roman Leakee. September 21, 2010 – FCW: Roman Leakee defeated Fahd Rakman. September 23, 2010 – FCW: Big E Langston and Conrad Tanner and Bobby Dutch defeated Roman Leakee and Fahd Rakman and Cable Jones. October 28, 2010 – FCW: Vance Archer defeated Roman Leakee. November 11, 2010 – FCW: Damien Sandow defeated Bobby Dutch and Big E Langston and Marcus Owens and Roman Leakee in a Thursday Night Rumble. December 2, 2010 – FCW: Matt Clements and Kenny Li and Chimaera (Ricardo Rodriguez) and Buck Dixon and Husky Harris (w/Michael McGillicutty) defeated Big E Langston and James Bronson and Kevin Hackman and Roman Leakee and Darren Young. January 6, 2011 – FCW: Bo Rotundo beat FCW champion Mason Ryan and Roman Leakee and Calvin Raines in a Non-title 4-WAY. January 16, 2011 – FCW: Calvin Raines defeated Bo Rotundo and Brad Maddox and Damien Sandow and Hunico and Jinder Mahal and Kenny Li and Lucky Cannon and Marcus Owens and Percy Watson and Peter Orlov and Richie Steamboat and Roman Leakee and Seth Rollins and Titus O’Neill and Xavier Woods in the Grand Royal match. January 30, 2011 – FCW: Leakee defeated Peter Orlov (w/ James Bronson). February 20, 2011 – FCW: Leakee defeated Peter Orlov (w/ James Bronson). February 27, 2011 – FCW: Leakee defeated Bobby Dutch. March 13, 2011 – FCW: Donny Marlow and Leakee defeated FCW Tag Team Champions Damien Sandow and Titus O’Neill (w/ Ricardo Rodriguez) by disqualification. March 20, 2011 – FCW: Damien Sandow and Titus O’Neill defeated Donny Marlow and Roman Leakee by disqualification. April 3, 2011 – FCW: Donny Marlow and Roman Leakee defeated FCW tag team champions Damien Sandow and Titus O’Neill in a no disqualification match. May 8, 2011 – FCW: Leakee defeated James Bronson. May 22, 2011 – FCW: Leakee defeated Bobby Dutch. June 19, 2011 – FCW: Leakee defeated Ricardo Rodriguez (w/ Brodus Clay). July 10, 2011 – FCW: Johnny Curtis defeated Leakee and Mason Ryan and Seth Rollins. July 24, 2011 – FCW: Bo Rotundo, Leakee and Richie Steamboat defeated Alexander Rusev, Big E. Langston and Calvin Raines. August 7, 2011 – FCW: Leakee and Titus O’Neil defeated Erick Rowan and James Bronson (w/ Byron Saxton). August 21, 2011 – FCW: Leakee defeated James Bronson (w/ Byron Saxton). September 4, 2011 – FCW: Leakee defeated Damien Sandow. September 25, 2011 – FCW: Damien Sandow defeated Leakee in the Super 8 Tourmanent. October 23, 2011 – FCW: Leakee defeated Ricardo Rodriguez. December 11, 2011 – FCW: Antonio Cesaro defeated Leakee. January 1, 2012 – FCW: Leakee defeated James Bronson. January 8, 2012 – FCW: Dean Ambrose and Leakee defeated Damien Sandow and Leo Kruger. January 18, 2012 – FCW: Leakee and Bo Rotundo defeated Eli Cottonwood and Leo Kruger. January 22, 2012 – FCW: Mike Dalton defeated Big E. Langston and Brad Maddox and Briley Pierce and Damien Sandow and Dean Ambrose and Epico and Hunico and Husky Harris and Kenneth Cameron and Leakee and Richie Steamboat and Rick Victor and Xavier Woods. February 5, 2012 – FCW: Leakee defeated Dean Ambrose and Seth Rollins in a #1 contender for the FCW Heavyweight Title. February 12, 2012 – FCW: FCW Heavyweight Champion Leo Kruger defeated Leakee to retain. June 22, 2012 – FCW: FCW tag team champions Leakee and Mike Dalton defeated Corey Graves and Jake Carter to retain the titles. June 29, 2012 – FCW: Leakee defeated Colin Cassady. July 5, 2012 – FCW: Leakee defeated Leo Kruger. July 20-22, 2012 – WWE House Show: Leakee defeated Curt Hawkins. September 14, 2012 – SmackDown! : Roman Reigns defeated Heath Slater in a dark match. October 24, 2012 – NXT House Show: Roman Reigns defeated David Howard. October 31, 2012 – NXT: Roman Reigns defeated CJ Parker via pin fall. November 07, 2012 – NXT: Roman Reigns cut a promo about how everyone is better with him in the building and he is the man, and that everyone wants to be him. November 14, 2012 – NXT: Roman Reigns defeated Chase Donovan. December 6, 2012 – NXT: Roman Reigns defeated Gavin Reid. November 18, 2012 – Survivor Series ’12: During the main event triple threat match for the WWE Championship, Seth Rollins, Dean Ambrose, and Roman Reigns attacked Ryback and took him out of the match by powerbombing him through the announcer’s table, leading CM Punk to retain the gold. November 19, 2012 – RAW: Ryback came down to ruin CM Punk’s celebration when Roman Reigns, Seth Rollins and Dean Ambrose attacked him again, and once again powerbombed Ryback through the announcer’s table. November 26, 2012 – RAW: Dean Ambrose, Seth Rollins and Roman Reigns were interviewed by Michael Cole earlier in the day. The trio said they had no affiliation with Punk, and they talked about how everyone in the WWE answers to someone and ultimately to the WWE universe, so they are a shield, a shield for injustice. 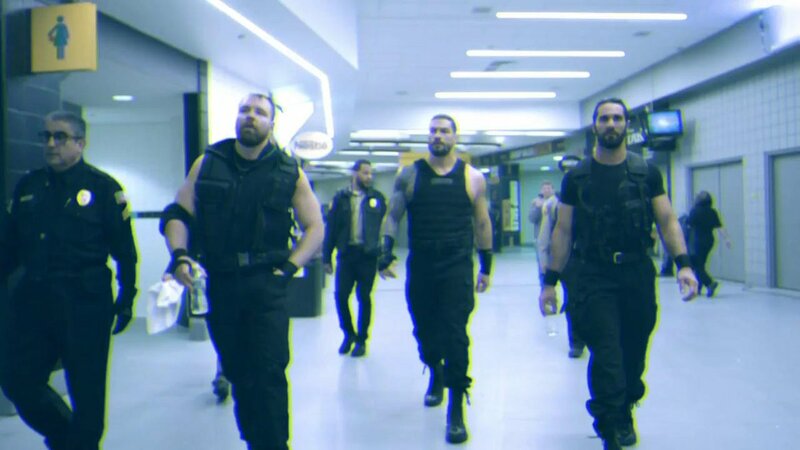 They are the Shield. ~~~ At the end of the show during the CM Punk vs. Kane match, Dean Ambrose, Seth Rollins and Roman Reigns attacked Kane. Then Daniel Bryan and Ryback came in for the save but the 4 on 3 numbers were too much and Punk was left standing tall over Ryback again. December 3, 2012 – RAW: The Shield (Seth Rollins, Dean Ambrose, Roman Reigns) attacked Team Hell No after their match with the Prime Time Players. ~~~ Later in the night they attacked Randy Orton after his match with Brad Maddox. ~~~At the end of the night during CM Punk’s Lie detector test the Shield attacked The Miz. Team Hell No came out for the save along with Ryback. December 16, 2012 – TLC: The Shield (Dean Ambrose, Seth Rollins, and Roman Reigns) defeated Kane, Daniel Bryan, and Ryback in a TLC match. December 31, 2012 – TLC: The Shield (Dean Ambrose, Seth Rollins, and Roman Reigns) fought Ryback to a no contest. February 17, 2013 – Elimination Chamber: the Shield (Dean Ambrose, Seth Rollins, and Roman Reigns) defeated John Cena, Ryback, and Sheamus. February 18, 2013 – RAW: The Shield (Dean Ambrose, Seth Rollins, and Roman Reigns) defeated Chris Jericho, Ryback, and Sheamus. March 8, 2013 – SmackDown: Sheamus defeated the Big Show by disqualification (The Shield interfered). March 15, 2013 – SmackDown: Ryback fought Mark Henry to a no contest (The Shield interfered). April 7, 2013 – WrestleMania 29: The Shield defeated Randy Orton, Sheamus, and Big Show. April 10, 2013 – Main Event: the Shield defeated Kofi Kingston, Brodus Clay and Tensai. April 11, 2013 – NXT: Seth Rollins, Dean Ambrose and Roman Reigns defeated Scott Dawson, Percy Watson and Axl Keegan. April 22, 2013 – RAW: The Shield defeated the Undertaker and the WWE tag team champions Team Hell No. April 25, 2013 – NXT: Seth Rollins defeated Corey Graves lumberjack match. April 29, 2013 – RAW: The Shield defeated WWE champion John Cena and the WWE tag team champions Team Hell No in a 6-man tag team match. May 6, 2013 – RAW: The Shield defeated WWE United States champion Kofi Kingston and the Uso Brothers in a 6-man tag team match. May 10, 2013 – Live Event: WWE Tag Champions Kane and Daniel Bryan defeated Seth Rollins and Roman Reigns by disqualification. May 13, 2013 – RAW: John Cena won a 6-man tag team elimination match by disqualification. ~~~Original teams: John Cena and the WWE tag team champions Team Hell No vs. the Shield. ~~~1st – Kane was eliminated by disqualification. ~~~2nd – Daniel Bryan defeated Dean Ambrose. ~~~3rd – Roman Reigns was eliminated by disqualification. ~~~4th – Dean Ambrose and Seth Rollins were eliminated by disqualification. May 17, 2013 – SmackDown: Seth Rollins and Roman Reigns (w/ Dean Ambrose) defeated Jimmy and Jey Uso. May 19, 2013 – Extreme Rules: Seth Rollins and Roman Reigns defeated WWE world tag team champions Team Hell No in a Tornado match to win the titles. May 20, 2013 – RAW: The Shield (WWE United States champion Dean Ambrose and WWE world tag team champions Seth Rollins and Roman Reigns) defeated Team Hell No and Kofi Kingston in a 6-man tag team match. May 24, 2013 – SmackDown: The Shield (WWE United States champion Dean Ambrose and WWE world tag team champions Seth Rollins and Roman Reigns) defeated Kofi Kingston, Randy Orton, and Sheamus in a 6-man tag team match. May 27, 2013 – RAW: WWE world tag team champions the Shield (Seth Rollins and Roman Reigns) defeated Team Hell No to retain the titles. May 31, 2013 – SmackDown: Roman Reigns defeated Daniel Bryan by disqualification. June 3, 2013 – RAW: The Shield (WWE United States champion Dean Ambrose and WWE world tag team champions Seth Rollins and Roman Reigns) defeated Kane, Randy Orton, and Daniel Bryan in a 6-man tag team match. June 7, 2013 – SmackDown: Randy Orton and Daniel Bryan defeated WWE world tag team champions Seth Rollins and Roman Reigns by disqualification in a non-title match. June 10, 2013 – RAW: Randy Orton fought Roman Reigns to a no contest. June 14, 2013 – SmackDown: Kane, Daniel Bryan, and Randy Orton defeated The Shield (WWE United States champion Dean Ambrose and WWE world tag team champions Seth Rollins and Roman Reigns) in a 6-man tag team match. June 16, 2013 – Payback: WWE world tag team champions Seth Rollins and Roman Reigns defeated Daniel Bryan and Randy Orton to retain the titles. June 19, 2013 – Live Event: The Shield defeated The Uso’s and Justin Gabriel. June 28, 2013 – SmackDown: Christian and the Usos defeated The Shield (WWE United States champion Dean Ambrose and WWE world tag team champions Seth Rollins and Roman Reigns) in a 6-man tag team match. July 1, 2013 – RAW: The Shield (WWE United States champion Dean Ambrose and WWE world tag team champions Seth Rollins and Roman Reigns) defeated Christian and the Usos in a 6-man tag team match. July 8, 2013 – RAW: WWE world tag team champions Seth Rollins and Roman Reigns defeated Brodus Clay and Tensai in a non-title match. July 14, 2013 – Money in the Bank: WWE world tag team champions Seth Rollins and Roman Reigns defeated the Usos to retain the titles. July 26, 2013 – Live Event: Kane, Daniel Bryan and WWE Champion John Cena defeated The Shield. July 27, 2013 – Live Event: Kane and Daniel Bryan defeated WWE Tag Team Champions Seth Rollins and Roman Reigns by disqualification. July 29, 2013 – RAW: The Shield (WWE United States champion Dean Ambrose and WWE world tag team champions Seth Rollins and Roman Reigns) defeated Mark Henry and the Usos in a 6-man tag team match. August 5, 2013 – RAW: WWE champion John Cena, Randy Orton, and Daniel Bryan defeated the Shield (WWE United States champion Dean Ambrose and WWE world tag team champions Seth Rollins and Roman Reigns) in a 6-man tag team match. August 7, 2013 – Live Event: The Shield defeated The Uso’s and Mark Henry. August 14, 2013 – NXT: the Shield defeated Adrian Neville, Corey Graves & Xavier Woods. August 16, 2013 – SmackDown: Rob Van Dam, Big Show, and Mark Henry defeated the Shield in a 6-man tag team match. August 16, 2013 – Live Event: Daniel Bryan, defeated Dolph Ziggler, Rob Van Dam, Christian, Mark Henry, R-Truth, Ryback, Big E Langston, Dean Ambrose, Roman Reigns, Seth Rollins in a battle royal. Mark Henry, Christian & Rob Van Dam defeated the Shield. August 19, 2013 – RAW: the Shield (WWE United States champion Dean Ambrose and WWE world tag team champions Seth Rollins and Roman Reigns) defeated Dolph Ziggler in a “3-on-1” handicap match. August 19, 2013 – RAW: The Shield (WWE United States champion Dean Ambrose and WWE world tag team champions Seth Rollins and Roman Reigns) defeated the Big Show in a “3-on-1” handicap Texas tornado match. August 21, 2013 – Main Event: the Shield defeated The Uso’s and Kofi Kingston. August 24, 2013 – Live Event: United States champion Dean Ambrose defeated Rob Van Dam to retain the title. August 24, 2013 – Live Event: The Big Show and Mark Henry defeated the Shield (Seth Rollins and Roman Reigns) via disqualification. ~~~Daniel Bryan defeated Seth Rollins. ~~~Daniel Bryan defeated WWE United States champion Dean Ambrose by disqualification in a non-title match. ~~~Daniel Bryan defeated Roman Reigns by disqualification. August 30, 2013 – SmackDown: The Shield defeated Dolph Ziggler in a “3-on-1” handicap match. August 31, 2013 – Live Event: The Big Show and Mark Henry defeated the Shield (Seth Rollins and Roman Reigns) via disqualification. September 6, 2013 – Live Event: WWE tag team champions Seth Rollins and Roman Reigns defeated The Usos to retain the titles. September 13, 2013 – SmackDown: The Shield (WWE United States champion Dean Ambrose and WWE world tag team champions Seth Rollins and Roman Reigns) defeated Dolph Ziggler and the Usos in a 6-man tag team match. September 14, 2013 – Live Event: WWE tag team champions Seth Rollins and Roman Reigns defeated The Prime Time Players to retain the titles. September 15, 2013 – Night of Champions: WWE world tag team champions Seth Rollins and Roman Reigns defeated the Prime Time Players to retain the titles. September 16, 2013 – RAW: Daniel Bryan defeated Roman Reigns by disqualification. ~~~Match #1: the Shield defeated Darren Young. ~~~Match #2: the Shield defeated Titus O’Neil. ~~~Match #3: the Shield defeated Dolph Ziggler by count-out. ~~~Match #4: the Shield defeated Kofi Kingston. ~~~Match #5: the Shield fought Rob Van Dam to a no contest when Triple H stops the gauntlet match. September 20, 2013 – SmackDown: Daniel Bryan and the Uso Brothers defeated The Shield (WWE United States champion Dean Ambrose and WWE tag team champions Seth Rollins and Roman Reigns) in a 6-man tag team match. September 23, 2013 – RAW: Daniel Bryan, the Usos, the Prime Time Players, Kofi Kingston, Justin Gabriel, R-Truth, Zack Ryder, Dolph Ziggler, and Rob Van Dam defeated The Shield (WWE United States champion Dean Ambrose and WWE tag team champions Seth Rollins and Roman Reigns) in an “11-on-3” tag team elimination match. September 27, 2013 – SmackDown: The Shield (WWE United States champion Dean Ambrose and WWE tag team champions Seth Rollins and Roman Reigns) defeated Kofi Kingston, Dolph Ziggler, and Rob Van Dam. September 28, 2013 – Live Event: WWE tag team champions Seth Rollins and Roman Reigns defeated Tons of Funk & Kofi Kingston and The Miz in a 3-way match to retain the titles. September 30, 2013 – RAW: the Shield (WWE United States champion Dean Ambrose and WWE tag team champions Seth Rollins and Roman Reigns) defeated Dolph Ziggler and the Usos. October 4, 2013 – SmackDown: Big Show defeated The Shield (WWE United States champion Dean Ambrose and WWE tag team champions Seth Rollins and Roman Reigns) and Randy Orton by disqualification in a “4-on-1” handicap match. October 5, 2013 – Live Event: WWE tag team champions Seth Rollins and Roman Reigns defeated Dolph Ziggler and The Miz to retain the title. October 6, 2013 – Battleground: Cody Rhodes and Goldust defeated WWE tag team champions Seth Rollins and Roman Reigns to regain their jobs in WWE. ~~~Note: This was a non-title match. October 7, 2013 – RAW: The Shield (WWE United States champion Dean Ambrose and WWE tag team champions Seth Rollins and Roman Reigns) defeated Cody Rhodes, Goldust, and Daniel Bryan. October 12, 2013 – Live Event: The Big Show defeated Seth Rollins and Roman Reigns in a handicap match. October 14, 2013 – RAW: Cody Rhodes and Goldust defeated WWE tag team champions Seth Rollins and Roman Reigns to win the titles. October 18, 2013 – SmackDown: Daniel Bryan and WWE tag team champions Cody Rhodes and Goldust defeated The Shield (WWE United States champion Dean Ambrose and Seth Rollins and Roman Reigns). October 21, 2013 – RAW: The Usos fought Seth Rollins and Roman Reigns to a no contest in a #1 contenders match for the tag team titles. ~~~WWE tag team champions Cody Rhodes and Goldust interfered in the match. October 25, 2013 – SmackDown: Daniel Bryan, Big E Langston, and WWE tag team champions Cody Rhodes and Goldust defeated Randy Orton and the Shield (WWE United States champion Dean Ambrose and Seth Rollins and Roman Reigns) in an 8-man tag team match. October 27, 2013 – Hell in a Cell: WWE tag team champions Cody Rhodes and Goldust defeated the Usos and the Shield (Seth Rollins and Roman Reigns) in a triple threat match to retain the title. October 28, 2013 – RAW: The Usos and Big E Langston defeated The Shield (WWE United States champion Dean Ambrose and Seth Rollins and Roman Reigns) in a 6-man tag team match. November 4, 2013 – RAW: The Big Show defeated WWE champion Randy Orton and the Shield (WWE United States champion Dean Ambrose and Seth Rollins and Roman Reigns) by disqualification in a “4-on-1” handicap match. November 11, 2013 – RAW: C.M. Punk and Daniel Bryan defeated the Shield by disqualification in a “3-on-2” handicap match. ~~~The Wyatt Family interfered and caused the disqualification. November 12, 2013 – Live Event: Big E. Langston, Cody Rhodes and Goldust defeated the Shield. November 18, 2013 – RAW: C.M. Punk, Daniel Bryan, the Usos, and the WWE tag team champions Cody Rhodes and Goldust defeated the Shield and the Wyatt Family in a 12-man tag team match. November 22, 2013 – SmackDown: The Usos and Rey Mysterio, Jr. defeated The Shield in a 6-man tag team match. November 24, 2013 – Survivor Series: Roman Reigns was the sole survivor of a traditional Survivor Series match. ~~~Team Two: WWE tag team champions Cody Rhodes and Goldust, Rey Mysterio, Jr., and the Uso Brothers. November 25, 2013 – RAW: The Shield defeated WWE tag team champions Cody Rhodes and Goldust, Rey Mysterio, Jr. in a 6-man tag team match. November 29, 2013 – SmackDown: WWE tag team champions Cody Rhodes and Goldust defeated Roman Reigns and Seth Rollins by disqualification to retain the titles. ~~~Due to interference by Dean Ambrose, Vickie Guerrero booked a 6-man tag team match: C.M. Punk, Goldust, and Cody Rhodes defeated the Shield by disqualification. ~~~Due to interference by the Wyatt Family, Vickie Guerrero booked a 12-man tag team match: C.M. Punk, Goldust, Cody Rhodes, Rey Mysterio, Jr., and the Usos defeated The Shield and the Wyatt Family. December 2, 2013 – RAW: The Shield defeated WWE tag team champions Cody Rhodes and Goldust and the Big Show in 6-man tag team match. December 8, 2013 – Live Event: World tag team champions Cody Rhodes and Goldust defeated Seth Rollins and Roman Reigns to retain the titles. December 13, 2013 – SmackDown: Roman Reigns and Seth Rollins defeated the Uso Brothers. December 15, 2013 – TLC: C.M. Punk defeated The Shield in a “3-on1” handicap match. December 16, 2013 – RAW: The Shield defeated C.M. Punk and the Uso Brothers in a 6-man tag team match. December 20, 2013 – SmackDown: John Cena and CM Punk defeated The Shield by disqualification in a “3-on-2” handicap match. ~~~Daniel Bryan was attacked before the match by the Wyatt Family so he was unable to wrestle. December 23, 2013 – RAW: WWE Intercontinental champion Big E Langston, John Cena, and CM Punk defeated the Shield by disqualification in a 6-man tag team match. December 27, 2013 – SmackDown: Roman Reigns defeated Mark Henry. December 28, 2013 – Tribute to the Troops (Taped): Rey Mysterio and The Usos defeated The Shield in a dark match. January 3, 2014 – SmackDown: The Usos defeated Roman Reigns and Seth Rollins by disqualification. ~~~After the match GM Vickie Guerrero booked a 6-man tag team match between the Usos and CM Punk vs. the Shield. ~~~CM Punk and the Usos defeated the Shield. January 4, 2014 – Live Event: CM Punk defeated The Shield in a handicap match. January 6, 2014 – RAW: Roman Reigns defeated CM Punk. ~~~After the match Jake “The Snake” Roberts came to the ring and placed his snake on top of Dean Ambrose, who had been knocked out by CM Punk. January 18-19, 2014 – Live Event: CM Punk defeated The Shield in a handicap match. January 20, 2014 – RAW: The Shield defeated WWE Intercontinental champion Big E Langston and the WWE tag team champions Cody Rhodes and Goldust in a 6-man tag team match. January 25, 2014 – Live Event: WWE tag team champions Cody Rhodes and Goldust defeated Seth Rollins and Roman Reigns & Cesaro and Jack Swagger in a 3-way tag team match to retain the titles. January 26, 2014 – Royal Rumble: Roman Reigns participated in the 30-man Royal Rumble match which was eventually won by Batista. ~~~Reigns set a Royal Rumble record by eliminating 12 participants. January 27, 2014 – RAW: John Cena, Sheamus, and Daniel Bryan defeated the Shield in a 6-man “Elimination Chamber Qualifying Match”. ~~~The Wyatt Family interfered in the match to cause the disqualification. ~~~Cena, Sheamus, and Bryan are now qualified for the WWE Elimination Chamber pay-per-view. January 31, 2014 – SmackDown: The Shield defeated Sheamus, Rey Mysterio, Jr., and Daniel Bryan in a 6-man tag team match. February 1-2, 2014 – Live Event: Sheamus and The Usos defeated The Shield. February 3, 2014 – RAW: The Shield defeated WWE Intercontinental champion Big E Langston, Rey Mysterio, Jr., and Kofi Kingston in a 6-man tag team match. February 7, 2014 – SmackDown: WWE United States champion Dean Ambrose and Roman Reigns defeated Dolph Ziggler and Kofi Kingston. February 8-9, 2014 – Live Event: Christian and Sheamus defeated Roman Reigns and Seth Rollins. February 14, 2014 – SmackDown: The Shield defeated Sheamus, Christian, and Daniel Bryan in a 6-man tag team match. February 15-16, 2014 – Live Event: Christian, Daniel Bryan and Sheamus defeated The Shield. February 17, 2014 – RAW: Roman Reigns defeated Mark Henry. February 19, 2014 – Main Event: The Shield defeated Los Matadores and Sin Cara. February 23, 2014 – Elimination Chamber: The Wyatt Family defeated the Shield in a 6-man tag team match. February 24, 2014 – RAW: Bray Wyatt defeated Roman Reigns by disqualification. March 1-2, 2014 – Live Event: Kofi Kingston and The Big Show defeated Roman Reigns and Seth Rollins. March 3, 2014 – RAW: The Wyatt Family defeated the Shield in a 6-man tag team match. March 10, 2014 – RAW: Seth Rollins and Roman Reigns defeated Cody Rhodes and Goldust. March 14-16, 2014 – Live Event: The Shield defeated The Wyatt Family. March 21-23, 2014 – Live Event: The Shield defeated The Wyatt Family. March 28, 2014 – SmackDown: The Shield defeated 3MB. March 31, 2014 – RAW: “Corporate” Kane defeated Roman Reigns by disqualification. April 8, 2014 – Main Event: The Shield defeated The Wyatt Family. April 12-13, 2014 – Live Event: John Cena and The Sheild defeated Kane and The Wyatt Family. April 14, 2014 – RAW: Randy Orton and Batista defeated the WWE tag team champions the Usos by disqualification in a non-title match when the Shield interfered. April 14, 2014 – RAW: The Shield defeated Alberto Del Rio, Fandango, Heath Slater, Titus O’Neil, Jack Swagger, Jinder Mahal, Drew McIntyre, Ryback, Curtis Axel, Alexander Rusev, and Wade Barrett by disqualification when Triple H, Batista, and Randy Orton interfered. ~~~Triple H, Batista, and Orton reformed Evolution. April 17, 2014 – Live Event: The Shield defeated The Wyatt Family. April 18, 2014 – Live Event: Roman Reigns and Seth Rollins defeated Erick Rowan and Luke Harper. April 19, 2014 – Live Event: Roman Reigns defeated Randy Orton. April 25, 2014 – SmackDown: The Shield defeated Titus O’Neil, Ryback, Alberto Del Rio, Damien Sandow, Wade Barrett, and Curtis Axel in a “6-on-3” handicap match. April 28, 2014 – RAW: Roman Reigns fought Randy Orton to a no contest. ~~~The Shield and Evolution interfered. May 2-3, 2014 – Live Event: John Cena and The Shield defeated The Wyatt Family and Alberto Del Rio. May 4, 2014 – Extreme Rules: The Shield defeated Evolution in a 6-man tag team match. May 5, 2014 – RAW: The Wyatt Family defeated the Shield in a 6-man tag team match. May 9, 2014 – SmackDown: Roman Reigns defeated Mark Henry. May 12, 2014 – RAW: Roman Reigns defeated Batista by disqualification. May 14-20, 2014 – Live Event: Roman Reigns defeated Randy Orton. May 21-24, 2014 – Live Event: The Shield defeated Randy Orton, Curtis Axel and Ryback. May 31, 2014 – Live Event: John Cena and The Shield defeated Kane and The Wyatt Family. June 1, 2014 – Payback: The Shield defeated Evolution in a “No Holds Barred” elimination match. June 2, 2014 – RAW: Roman Reigns fought Randy Orton to a no contest when Seth Rollins turned on Reigns and Dean Ambrose. June 9, 2014 – RAW: Roman Reigns and Dean Ambrose defeated 3MB in “3-on-2” handicap match. June 9, 2014 – RAW: John Cena, Roman Reigns, and Dean Ambrose defeated the Wyatt Family in a 6-man tag team match. June 13, 2014 – SmackDown: Roman Reigns defeated WWE Intercontinental champion Bad News Barrett in a non-title match. June 14-15, 2014 – Live Event: Roman Reigns defeated Bray Wyatt. June 16, 2014 – RAW: Roman Reigns won a “Money in the Bank” qualifying battle royale. The participants included: Titus O’Neil, Sin Cara, Santino Marella, Kofi Kingston, Big E, Ryback, Damien Sandow, Rusev, Bo Dallas, Jack Swagger, Diego, Fernando, Dolph Ziggler, Xavier Woods, Fandango, Rob Van Dam, Bad News Barrett, and Curtis Axel. June 20, 2014 – SmackDown: WWE United States champion Sheamus, John Cena, and Roman Reigns defeated Randy Orton, Alberto Del Rio, Cesaro, and Bray Wyatt in a “4-on-3” handicap match. June 23, 2014 – RAW: WWE United States champion Sheamus, John Cena, and Roman Reigns defeated Randy Orton, Alberto Del Rio, Cesaro, and Bray Wyatt in a “4-on-3” handicap match. June 27, 2014 – SmackDown: Roman Reigns defeated Kane by disqualification. June 29, 2014 – Money in the Bank: John Cena defeated Kane, Randy Orton, Alberto Del Rio, Sheamus, Roman Reigns, Bray Wyatt and Cesaro in a “Money in the Bank” ladder match to win the vacant WWE world heavyweight championship. June 30, 2014 – RAW: WWE world heavyweight champion John Cena and Roman Reigns defeated Randy Orton and Kane by disqualification. July 4-5, 2014 – Live Event: Roman Reigns defeated Bray Wyatt. July 6, 2014 – Live Event: Roman Reigns defeated Randy Orton. July 11, 2014 – SmackDown: Roman Reigns defeated Rusev by disqualification. July 12, 2014 – Live Event: Roman Reigns defeated Kane. July 14, 2014 – RAW: WWE world heavyweight champion John Cena and Roman Reigns defeated Kane, Seth Rollins, and Randy Orton by disqualification in a “3-on-2” handicap tag team match. July 18, 2014 – Live Event: Roman Reigns defeated Kane. July 19, 2014 – Live Event: Roman Reigns and Dean Ambrose defeated Randy Orton and Seth Rollins by disqualification. July 20, 2014 – Battleground: WWE world heavyweight champion John Cena defeated Roman Reigns, Kane, and Randy Orton in a fatal 4-way match to retain the title. July 21, 2014 – RAW: Roman Reigns defeated Kane and Randy Orton in a “2-on-1” handicap match. July 25, 2014 – SmackDown: Roman Reigns defeated Alberto Del Rio. July 26-27, 2014 – Live Event: Roman Reigns defeated Randy Orton. July 28, 2014 – RAW: Roman Reigns fought Kane to a no contest. August 4, 2014 – RAW: Roman Reigns defeated Kane in a “Last Man Standing” match. August 7-9, 2014 – Live Event: Roman Reigns defeated Kane. August 11, 2014 – RAW: Roman Reigns defeated Ryback and Curtis Axel in a “2-on-1” handicap match. August 15, 2014 – SmackDown: Roman Reigns defeated WWE Intercontinental champion The Miz in a non-title match. August 16, 2014 – Live Event: Roman Reigns defeated Randy Orton. August 17, 2014 – SummerSlam: Roman Reigns defeated Randy Orton. August 18, 2014 – RAW: WWE United States champion Sheamus, Rob Van Dam, and Roman Reigns defeated Ryback, Curtis Axel, and Randy Orton in a 6-man tag team match. August 22, 2014 – SmackDown: Roman Reigns defeated The Miz. August 23-24, 2014 – Live Event: Roman Reigns defeated Seth Rollins. August 25, 2014 – RAW: Roman Reigns defeated Kane and Seth Rollins by disqualification in a “2-on-1” handicap match. August 29, 2014 – SmackDown: Roman Reigns defeated Bray Wyatt by disqualification. August 29, 2014 – SmackDown: Roman Reigns, Mark Henry, and the Big Show defeated the Wyatt Family in a 6-man tag team match. September 1, 2014 – RAW: Roman Reigns, John Cena, and Chris Jericho defeated Randy Orton, Kane, and Seth Rollins in a 6-man tag team match. September 5, 2014 – SmackDown: John Cena, Roman Reigns, Chris Jericho, Mark Henry, and the Big Show defeated Bray Wyatt, Luke Harper, Erick Rowan, Kane, and Seth Rollins in a 10-man tag team match. September 6-7, 2014 – Live Event: Roman Reigns defeated Seth Rollins. September 8, 2014 – RAW: Roman Reigns defeated Randy Orton by disqualification. September 12, 2014 – SmackDown: Chris Jericho and Roman Reigns defeated Randy Orton and Seth Rollins. September 13-14, 2014 – Live Event: Roman Reigns defeated Randy Orton. September 15, 2014 – RAW: Roman Reigns defeated Seth Rollins. September 19, 2014 – SmackDown: Rusev defeated Roman Reigns by disqualification. September 21, 2014 – Night of Champions: Seth Rollins defeated Roman Reigns by forfeit. ~~~Roman Reigns underwent emergency surgery for an incarcerated hernia the night before. December 8, 2014 – Roman Reigns wins the WWE Slammy Award for “Superstar of the Year”. December 19, 2014 – SmackDown: Roman Reigns defeated Fandango. December 22, 2014 – RAW: Roman Reigns defeated the Big Show by count out. December 26, 2014 – SmackDown: WWE Intercontinental champion Dolph Ziggler and Roman Reigns defeated Seth Rollins and Big Show. December 29, 2014 – RAW: Roman Reigns defeated Seth Rollins by disqualification. January 2, 2015 – SmackDown: Roman Reigns defeated WWE United States champion Rusev by disqualification in a non-title match. January 5, 2015 – RAW: Roman Reigns defeated the Big Show by disqualification. January 9, 2015 – SmackDown: Roman Reigns and Dean Ambrose defeated Big Show and Seth Rollins. January 12, 2015 – RAW: Roman Reigns defeated Luke Harper. January 15, 2015 – SmackDown: Daniel Bryan, Roman Reigns, and Dean Ambrose defeated Kane, Big Show, and Seth Rollins in a 6-man tag team match. January 16, 2015 – Live Event: Daniel Bryan and Roman Reigns defeated Kane and The Big Show. January 24, 2015 – Live Event: Dean Ambrose and Roman Reigns defeated The Big Show and Bray Wyatt. January 25, 2015 – Royal Rumble: Roman Reigns wins the 30-man Royal Rumble match to become the #1 contender for the WWE world heavyweight championship. The order of elimination: Miz, R-Truth, Bubba Ray Dudley, Curtis Axel, Luke Harper, Boogeyman, Sin Cara, Zach Ryder, Tyson Kidd, DDP, Fandango, Daniel Bryan, Adam Rose, Kofi Kingston, Stardust, Goldust, Mizdow, Titus O’Neil, Big E, Ryback, Jack Swagger, Wade Barrett, Cesaro, Dolph Ziggler, Bray Wyatt, Dean Ambrose, Kane, Big Show, and Rusev. January 29, 2015 – SmackDown: Roman Reigns defeated the Big Show. February 2, 2015 – RAW: The Big Show defeated Roman Reigns. February 5, 2015 – SmackDown: Roman Reigns defeated the Miz. February 6-8, 2015 – Live Event: Roman Reigns defeated The Big Show. February 9, 2015 – RAW: Roman Reigns and Daniel Bryan defeated Kane and the Big Show by disqualification. February 12, 2015 – SmackDown: Roman Reigns and Daniel Bryan defeated the following teams in ‘tag team turmoil’: Miz/Mizdow, the Usos, Los Matadores, Heath Slater/Titus O’Neil, the Ascension (by DQ), and Kane/Big Show. February 14-15, 2015 – Live Event: Roman Reigns defeated The Big Show. February 16, 2015 – RAW: Roman Reigns defeated Kane by count-out. February 19, 2015 – SmackDown: Roman Reigns defeated Luke Harper. February 22, 2015 – Fastlane: Roman Reigns defeated Daniel Bryan to become the #1 contender for the WWE world heavyweight championship. February 23, 2015 – RAW: Roman Reigns and Daniel Bryan defeated Seth Rollins and Randy Orton. February 27, 2015 – Live Event: Roman Reigns and Daniel Bryan defeated Kane and Seth Rollins. March 2, 2015 – RAW: Seth Rollins defeated Roman Reigns. March 7-8, 2015 – Live Event: Roman Reigns defeated The Big Show. March 9, 2015 – RAW: Roman Reigns defeated Seth Rollins and Randy Orton in a “2-on-1” handicap match. March 14-16, 2015 – Live Event: Roman Reigns defeated Kane. March 19, 2015 – SmackDown: Roman Reigns defeated Kane and Seth Rollins in a “2-on-1” handicap match. ~~~Roman’s partner, Mark Henry, was injured backstage before the match. March 21-22, 2015 – Live Event: Roman Reigns defeated Bray Wyatt. March 26, 2015 – SmackDown: John Cena, Daniel Bryan, Mark Henry, and Roman Reigns defeated Kane, Seth Rollins, Bray Wyatt, and Big Show in an 8-man tag team match. March 29, 2015 – WrestleMania 31: Seth Rollins defeated WWE world heavyweight champion Brock Lesnar and Roman Reigns in a triple threat match to win the title. ~~~Rollins cashed in his “Money in the Bank” briefcase during the match between Lesnar and Reigns, making it a triple threat match. March 30, 2015 – RAW: Roman Reigns, Randy Orton, and Ryback defeated WWE world heavyweight champion Seth Rollins, Kane, and Big Show in a 6-man tag team match. April 6, 2015 – RAW: Roman Reigns defeated the Big Show. April 6, 2015 – RAW: Randy Orton defeated Ryback and Roman Reigns to become the #1 contender for the WWE world heavyweight title. April 9, 2015 – SmackDown: Roman Reigns, WWE Intercontinental champion Daniel Bryan, and Dolph Ziggler defeated Bad News Barrett, the Big Show, and Sheamus in a 6-man tag team match. April 9-12, 2015 – Live Event: Roman Reigns defeated The Big Show. April 16, 2015 – Live Event: Roman Reigns and Dolph Ziggler defeated Sheamus and The Big Show. April 17-18, 2015 – Live Event: Roman Reigns defeated The Big Show. April 23, 2015 – SmackDown: Dean Ambrose and Roman Reigns defeated Luke Harper and WWE world heavyweight champion Seth Rollins. April 26, 2015 – Extreme Rules: Roman Reigns defeated the Big Show in a “Last Man Standing” match. April 27, 2015 – RAW: Randy Orton and Roman Reigns defeated Kane and WWE world heavyweight champion Seth Rollins. April 30, 2015 – SmackDown: Roman Reigns defeated Kane by count-out. May 4, 2015 – RAW: The New Day defeated Randy Orton and Roman Reigns in a “3-on-2” handicap match. May 4, 2015 – RAW: Randy Orton fought Roman Reigns to a no contest. May 9-10, 2015 – Live Event: Roman Reigns defeated Kane. May 11, 2015 – RAW: Kane fought Roman Reigns to a no contest. May 14, 2015 – SmackDown: Roman Reigns defeated Kane. May 17, 2015 – Payback: WWE world heavyweight champion Seth Rollins defeated Dean Ambrose, Roman Reigns, and Randy Orton in a “Fatal 4-Way” match to retain the title. ~~~Kane helped Rollins retain the title. May 23-24, 2015 – Live Event: Roman Reigns defeated The Big Show. May 25, 2015 – RAW: Roman Reigns and Dean Ambrose defeated WWE world heavyweight champion Seth Rollins and Kane. May 28, 2015 – SmackDown: Roman Reigns and Dean Ambrose defeated WWE world heavyweight champion Seth Rollins and Kane by disqualification. June 1, 2015 – RAW: Roman Reigns defeated King Barrett. June 1, 2015 – RAW: Roman Reigns defeated Mark Henry by count-out. June 1, 2015 – RAW: Roman Reigns defeated Bray Wyatt. June 4, 2015 – SmackDown: Roman Reigns defeated Sheamus by disqualification. June 6-7, 2015 – Live Event: Roman Reigns defeated The Big Show. June 8, 2015 – RAW: Roman Reigns defeated Kofi Kingston. June 11, 2015 – SmackDown: Roman Reigns, Randy Orton, and Neville defeated Sheamus, Kane, and Kofi Kingston by disqualification. June 13, 2015 – Live Event: Roman Reigns defeated The Big Show. June 14, 2015 – Money in the Bank: Sheamus defeated Roman Reigns, Randy Orton, Neville, Kane, Dolph Ziggler, and Kofi Kingston in a “Money in a Bank” ladder match. June 20-21, 2015 – Live Event: WWE champion Seth Rollins defeated Roman Reigns to retain the title. June 22, 2015 – RAW: Roman Reigns fought Sheamus to a no contest due to interference by Bray Wyatt. June 28, 2015 – Live Event: Roman Reigns defeated Bray Wyatt. June 29, 2015 – RAW: Kane and WWE world heavyweight champion Seth Rollins defeated Dean Ambrose and Roman Reigns in a ‘no disqualification’ tag team match. July 2, 2015 – SmackDown: Roman Reigns defeated WWE world heavyweight champion Seth Rollins by disqualification in a non-title match. July 4-5, 2015 – Live Event: Roman Reigns defeated Bray Wyatt. July 6, 2015 – RAW: Sheamus defeated Roman Reigns by count-out. July 9, 2015 – SmackDown: Roman Reigns defeated the Big Show by disqualification. July 10-12, 2015 – Live Event: Roman Reigns defeated Bray Wyatt. July 13, 2015 – RAW: Bray Wyatt fought Dean Ambrose to a no contest due to interference by Roman Reigns. July 16, 2015 – SmackDown: Dean Ambrose and Roman Reigns defeated Sheamus and the Big Show by disqualification. July 17-18, 2015 – Live Event: Roman Reigns defeated Bray Wyatt. July 19, 2015 – Battleground: Bray Wyatt defeated Roman Reigns. July 20, 2015 – RAW: Roman Reigns defeated Luke Harper by disqualification. August 1-2, 2015 – Live Event: Roman Reigns defeated Bray Wyatt. August 3, 2015 – RAW: Randy Orton, Roman Reigns, and Dean Ambrose defeated Bray Wyatt, Luke Harper, and Sheamus in a 6-man tag team match. August 6, 2015 – SmackDown: Roman Reigns defeated Rusev. August 8-9, 2015 – Live Event: Roman Reigns defeated Bray Wyatt. August 13, 2015 – SmackDown: Roman Reigns defeated Luke Harper by disqualification. August 15-16, 2015 – Live Event: Roman Reigns defeated Bray Wyatt. August 17, 2015 – RAW: Roman Reigns defeated Luke Harper. August 20, 2015 – SmackDown: Roman Reigns, Dean Ambrose, Cesaro, and Randy Orton defeated Bray Wyatt, Luke Harper, Sheamus, and Kevin Owens. August 23, 2015 – SummerSlam: Roman Reigns and Dean Ambrose defeated Bray Wyatt and Luke Harper. August 24, 2015 – RAW: Roman Reigns and Dean Ambrose defeated Bray Wyatt and Luke Harper by disqualification due to Braun Strowman’s interference. September 3, 2015 – SmackDown: Roman Reigns and Dean Ambrose defeated WWE tag team champions the New Day in a non-title match. August 29-30, 2015 – Live Event: Roman Reigns defeated Bray Wyatt. September 5-6, 2015 – Live Event: Roman Reigns defeated Bray Wyatt. September 7, 2015 – RAW: Roman Reigns and Dean Ambrose defeated the Ascension. September 10, 2015 – SmackDown: WWE tag team champions the New Day fought Dean Ambrose, Roman Reigns, and Jimmy Uso to a no contest due to Bray Wyatt’s interference. September 11, 2015 – Live Event: WWE champion & WWE United States champion Seth Rollins defeated Roman Reigns to retain both titles. September 12-13, 2015 – Live Event: Roman Reigns defeated Bray Wyatt. September 17, 2015 – SmackDown: Dean Ambrose and Roman Reigns defeated WWE world heavyweight champion and WWE United States champion Seth Rollins and Sheamus. September 20, 2015 – Night of Champions: Bray Wyatt, Luke Harper, and Braun Strowman defeated Dean Ambrose, Roman Reigns, and Chris Jericho in a 6-man tag team match. September 24, 2015 – SmackDown: Roman Reigns defeated Luke Harper. September 26-27, 2015 – Live Event: Dean Ambrose and Roman Reigns defeated Bray Wyatt and Braun Strowman. September 28, 2015 – RAW: Bray Wyatt fought Roman Reigns to a double count-out. October 3-4, 2015 – Live Event: Roman Reigns defeated Bray Wyatt. October 5, 2015 – RAW: Roman Reigns, Dean Ambrose, and Randy Orton defeated Bray Wyatt, Luke Harper, and Braun Strowman in a 6-man tag team match. October 8, 2015 – SmackDown: Roman Reigns and Randy Orton defeated Bray Wyatt and Braun Strowman by disqualification. October 10-11, 2015 – Live Event: Roman Reigns and Randy Orton defeated Bray Wyatt and Braun Strowman. October 12, 2015 – RAW: Roman Reigns defeated Braun Strowman by count-out. October 15, 2015 – SmackDown: Roman Reigns defeated Bo Dallas. October 16-18, 2015 – Live Event: Roman Reigns defeated Bray Wyatt. October 19, 2015 – RAW: The Shield defeated the Wyatt Family by disqualification in a 6-man tag team match. October 22, 2015 – SmackDown: Roman Reigns and Dean Ambrose defeated WWE tag team champions the New Day in a non-title match. October 25, 2015 – Hell in a Cell: Roman Reigns defeated Bray Wyatt in a Hell in a Cell match. October 26, 2015 – RAW: Roman Reigns defeated Kofi Kingston to advance to the Fatal 4-way main event match. October 26, 2015 – RAW: Roman Reigns defeated WWE Intercontinental champion Kevin Owens, WWE United States champion Alberto Del Rio, and Dolph Ziggler in a Fatal 4-way match to become the #1 contender for the WWE world heavyweight championship. October 29, 2015 – SmackDown: Roman Reigns defeated WWE Intercontinental champion Kevin Owens by count-out in a non-title match. November 2, 2015 – RAW: Roman Reigns, The Usos, Dean Ambrose, and Ryback defeated WWE world heavyweight champion Seth Rollins, WWE Intercontinental champion Kevin Owens, and the WWE tag team champions the New Day in a “Survivor Series” match. ~~~Roman Reigns and Dean Ambrose were the sole survivors. November 5-8, 2015 – Live Event: Roman Reigns defeated Bray Wyatt. November 9, 2015 – RAW: Roman Reigns defeated Big Show to advance in the WWE world heavyweight championship tournament. November 11-14, 2015 – Live Event: Roman Reigns defeated Bray Wyatt. November 16, 2015 – RAW: Roman Reigns defeated Cesaro to advance in the WWE world heavyweight championship tournament. November 19, 2015 – SmackDown: Dean Ambrose and Roman Reigns fought WWE Intercontinental champion Kevin Owens and WWE United States champion Alberto Del Rio to a double count-out. November 22, 2015 – Survivor Series: Roman Reigns defeated WWE United States champion Alberto Del Rio in a WWE world heavyweight championship tournament semi-finals match. November 22, 2015 – Survivor Series: Roman Reigns defeated Dean Ambrose in the WWE world heavyweight championship tournament finals match to become the new champion. ~~~After the match Sheamus cashed in his “Money in the Bank” briefcase and defeated WWE world heavyweight champion Roman Reigns to win the title! November 23, 2015 – RAW: Roman Reigns defeated Rusev by disqualification. December 14, 2015 – RAW: Roman Reigns defeated WWE world heavyweight champion Sheamus in a “job vs. title” match to win the title. November 30, 2015 – RAW: Roman Reigns defeated WWE world heavyweight champion Sheamus by disqualification in a non-title match. November 30, 2015 – RAW: The League of Nations and the WWE tag team champions the New Day defeated Roman Reigns, Dean Ambrose, and the Usos in a “7-on-4” tag team match. December 3, 2015 – SmackDown: Roman Reigns defeated The League of Nations in a “4-on-1” handicap match by count-out. December 7, 2015 – RAW: Team Reigns (Roman Reigns, the Usos, and Dean Ambrose) defeated the Wyatts, the League of Nations (Rusev, WWE world heavyweight champion Sheamus, WWE United States champion Alberto Del Rio, and King Barrett) and the ECW Originals (Tommy Dreamer, the Dudleyz, and Rhyno) in a fatal 4-way tag team match. December 10, 2015 – SmackDown: Roman Reigns fought WWE United States champion Alberto Del Rio to a no contest in a non-title match. December 10, 2015 – SmackDown: Roman Reigns, Dean Ambrose, and the Usos defeated The League of Nations in an 8-man tag team match. December 13, 2015 – TLC: WWE world heavyweight champion Sheamus defeated Roman Reigns in a TLC match to retain the title. December 23, 2015 – Tribute to the Troops: Dean Ambrose, Kane, Roman Reigns, Ryback, The Dudley Boyz (Bubba Ray Dudley & D-Von Dudley) & The Usos (Jey Uso & Jimmy Uso) defeated The League Of Nations (Alberto Del Rio, King Barrett, Rusev & Sheamus) & The Wyatt Family (Braun Strowman, Bray Wyatt, Erick Rowan & Luke Harper). December 19-20, 26-27, 2015 – Live Event: WWE world heavyweight champion Roman Reigns defeated Sheamus to retain the title. December 31, 2015 – SmackDown: WWE world heavyweight champion Roman Reigns and WWE Intercontinental champion Dean Ambrose defeated Sheamus and Kevin Owens by disqualification. January 4, 2016 – RAW: WWE world heavyweight champion Roman Reigns defeated Sheamus to retain the title. ~~~Vince McMahon was the special guest referee. January 9-10, 2016 – Live Event: WWE champion Roman Reigns defeated Sheamus to retain the title. January 11, 2016 – RAW: WWE world heavyweight champion Roman Reigns fought the Ascension, WWE tag team champions the New Day, Stardust, the Wyatt Family, Alberto Del Rio, Sheamus, Kevin Owens, and Tyler Breeze to a no contest in a “1 vs. All” match. ~~~Brock Lesnar interfered in the match to cause the no contest. January 15, 2016 – Live Event: WWE champion Roman Reigns defeated The Big Show to retain the title. January 18, 2016 – RAW: WWE world heavyweight champion Roman Reigns defeated Rusev in a non-title match. January 21, 2016 – SmackDown: WWE world heavyweight champion Roman Reigns defeated Sheamus, Rusev, WWE United States champion Alberto Del Rio, and King Barrett by disqualification in a handicap match. January 24, 2016 – Royal Rumble: Triple H won the 30-man Royal Rumble match to win the WWE world heavyweight title. ~~~Participants included: WWE world heavyweight champion Roman Reigns, Rusev, AJ Styles, Tyler Breeze, Curtis Axel, Chris Jericho, Kane, Goldust, Ryback, Kofi Kingston, Titus O’Neil, R-Truth, Luke Harper, Stardust, Big Show, Neville, Braun Strowman, Kevin Owens, Dean Ambrose, Sami Zayn, Erick Rowan, Mark Henry, Brock Lesnar, Jack Swagger, The Miz, Alberto Del Rio, Bray Wyatt, Dolph Ziggler, Sheamus and Triple H.
January 25, 2016 – RAW: Roman Reigns and WWE Intercontinental champion Dean Ambrose defeated Sheamus and Rusev. January 28, 2016 – SmackDown: Roman Reigns, WWE Intercontinental champion Dean Ambrose, and Chris Jericho defeated the Wyatt Family. January 30-31, 2016 – Live Event: Roman Reigns defeated Rusev. February 1, 2016 – RAW: Roman Reigns and WWE Intercontinental champion Dean Ambrose defeated WWE tag team champions the New Day in a non-title match. February 4, 2016 – SmackDown: Roman Reigns defeated Rusev by disqualification. February 4, 2016 – SmackDown: Roman Reigns and WWE Intercontinental champion Dean Ambrose defeated Alberto Del Rio and Rusev. February 6-7, 2016 – Live Event: Roman Reigns defeated Alberto Del Rio. February 10-13, 2016 – Live Event: Roman Reigns defeated Alberto Del Rio. February 18, 2016 – SmackDown: Roman Reigns and Dean Ambrose fought the Dudley Boyz to a no contest. February 21, 2016 – Fastlane: Roman Reigns defeated Brock Lesnar and Dean Ambrose in a triple threat match to become the #1 contender for the WWE world heavyweight championship. ~~~Reigns will face WWE world heavyweight championship Triple H at WrestleMania 32. February 22, 2016 – RAW: Roman Reigns defeated Sheamus by count-out. March 18, 2016 – Live Event: Dean Ambrose and Roman Reigns defeated Rusev and Sheamus. March 19-20, 2016 – Live Event: Dean Ambrose and Roman Reigns defeated King Barrett and Sheamus. March 24, 2016 – SmackDown: Roman Reigns fought Bubba Ray Dudley to a double count-out. March 25, 2016 – Live Event: Dean Ambrose and Roman Reigns defeated Sheamus and Triple H.
March 26-27, 2016 – Live Event: Dean Ambrose and Roman Reigns defeated King Barrett and Sheamus. April 3, 2016 – WrestleMania 32: Roman Reigns defeated WWE world heavyweight champion Triple H to win the title. April 11, 2016 – RAW: Roman Reigns and Bray Wyatt defeated Sheamus and Alberto Del Rio in the main event. April 13-17, 2016 – Live Event: WWE champion Roman Reigns defeated Sheamus to retain the title. April 19-23, 2016 – Live Event: WWE world heavyweight champion Roman Reigns defeated Sheamus to retain the title. April 25, 2016 – RAW: WWE World Heavyweight Champion Roman Reigns defeated Alberto Del Rio in a non-title match. April 28, 2016 – SmackDown: WWE World Heavyweight Champion Roman Reigns defeated WWE Intercontinental Champion The Miz. May 1, 2016 – Payback: WWE World Heavyweight Champion Roman Reigns defeated AJ Styles to retain the title. May 2, 2016 – RAW: AJ Styles, Luke Gallows & Karl Anderson defeated WWE World Heavyweight Champion Roman Reigns & The Usos. May 5, 2016 – SmackDown: The Usos & WWE World Heavyweight Champion Roman Reigns defeated AJ Styles, Luke Gallows & Karl Anderson. May 6, 2016 – Live Event: WWE world heavyweight champion Roman Reigns defeated AJ Styles and Kevin Owens in a 3-way match to retain the title. May 7-8, 2016 – Live Event: WWE world heavyweight champion Roman Reigns defeated Sheamus to retain the title. May 9, 2016 – RAW: WWE World Heavyweight Champion Roman Reigns & The Usos defeated The Club (AJ Styles, Luke Gallows & Karl Anderson) in a six-man elimination tag team match via disqualification. May 14-15, 2016 – Live Event: Roman Reigns and The Usos defeated Chris Jericho, Karl Anderson and Luke Gallows. May 19, 2016 – SmackDown: WWE World Heavyweight Champion Roman Reigns defeated Luke Gallows via disqualification. May 21, 2016 – Live Event: WWE world heavyweight champion Roman Reigns defeated Sheamus to retain the title. May 22, 2016 – Extreme Rules: WWE World Heavyweight Champion Roman Reigns defeated AJ Styles in an Extreme Rules Match to retain the title. May 27-29, 2016 – Live Event: WWE world heavyweight champion Roman Reigns defeated AJ Styles to retain the title. June 3,5 – 2016 – Live Event: WWE champion Roman Reigns defeated AJ Styles and Seth Rollins in a 3-way match to retain the title. June 11-12, 2016 – Live Event: WWE champion Roman Reigns defeated AJ Styles and Seth Rollins in a 3-way match to retain the title. June 17-18, 2016 – Live Event: WWE champion Roman Reigns defeated AJ Styles and Seth Rollins in a 3-way match to retain the title. June 21, 2016: Roman Reigns got suspended by WWE for 30 days for violating the company’s talent wellness policy. July 23, 2016 – Live Event: Roman Reigns defeated Kevin Owens. July 24, 2016 – WWE Battleground: WWE champion Dean Ambrose defeated Roman Reigns and Seth Rollins in a 3-way match to retain the title. July 25, 2016 – RAW: Roman Reigns defeated Chris Jericho, Sami Zayn and Sheamus in a 4-way match to advance in tonight’s main event. Finn Balor defeated Roman Reigns to become #1 contender for the WWE Universal title. July 29-31, 2016 – Live Event: Roman Reigns defeated AJ Styles and Seth Rollins in a 3-way match. August 6-7, 10, 206 – Live Event: Roman Reigns defeated Seth Rollins. August 11-12, 2016 – Live Event: Roman Reigns and Finn Balor defeated Chris Jericho and Seth Rollins. August 13, 2016 – Live Event: Roman Reigns defeated Seth Rollins. August 15, 2016 – RAW: Roman Reigns defeated WWE United States champion Rusev w Lana in a non-title match. August 22, 2016 – RAW: Roman Reigns defeated Chris Jericho in a #1 contenders qualifying match for the Universal title. August 27-28, 2016 – Live Event: Roman Reigns defeated Seth Rollins. August 29, 2016 – RAW: Kevin Owens defeated Big Cass, Roman Reigns and Seth Rollins in a 4-way elimination to win the vacant WWE Universal title. September 7-9, 2016 – Live Event: Roman Reigns defeated Chris Jericho. September 12, 2016 – RAW: WWE Universal champion Kevin Owens defeated Roman Reigns in a non-title match. September 19, 2016 – RAW: Roman Reigns defeated WWE Universal champion Kevin Owens in a non-title, steel cage non-title match. September 25, 2016 – Clash of the Champions: Roman Reigns defeated Rusev to win the United States title. September 26, 2016 – RAW: Roman Reigns vs. Rusev ended in a double count-out to retain the United States title. October 5-8, 2016 – Live Event: Roman Reigns defeated Rusev to retain the United States title. October 10, 2016 – RAW: Roman Reigns and Sasha Banks defeated Charlotte and Rusev. October 14-16, 2016 – Live Event: Roman Reigns defeated Rusev to retain the United States title. October 21-23, 2016 – Live Event: Roman Reigns defeated Rusev to retain the United States title. October 30, 2016 – Hell in a Cell: Roman Reigns defeated Rusev to retain the United States title in a Hell in a Cell match. October 31, 2016 – RAW: Roman Reigns defeated Chris Jericho by disqualification to retain the United States title. November 2-6, 8-9, 2016 – Live Event: Roman Reigns defeated Rusev to retain the United States title. November 7, 2016 – RAW: WWE Universal champion Kevin Owens defeated Braun Strowman, Chris Jericho, Roman Reigns and Seth Rollins in a 5-way, non-title match. November 8-9, 2016 – Live Event: Roman Reigns defeated Rusev to retain the United States title. November 14, 2016 – RAW: Roman Reigns and Kevin Owens defeated Cesaro and Sheamus. November 20, 2016 – Survivor Series: Team SmackDown LIVE (AJ Styles, Bray Wyatt, Dean Ambrose, Randy Orton & Shane McMahon) defeated Team RAW (Braun Strowman, Chris Jericho, Kevin Owens, Roman Reigns & Seth Rollins) in a tag team elimination match. November 26, 2016 – Live Event: Roman Reigns defeated Kevin Owens to retain the United States title. November 27, 2016 – Live Event: Roman Reigns and Seth Rollins defeated Chris Jericho and Kevin Owens. November 28, 2016 – RAW: WWE United States champion Roman Reigns defeated WWE Universal champion Kevin Owens in a non-title, #1 contenders match for the Universal title. December 3, 2016 – Live Event: Roman Reigns defeated Kevin Owens to retain the United States title. December 5, 2016 – RAW: Roman Reigns defeated Chris Jericho to retain the United States title. December 11, 2016 – Live Event: Roman Reigns defeated Kevin Owens to retain the United States title. December 12, 2016 – RAW: WWE tag team champions Big E and Xavier Woods defeated Seth Rollins and Roman Reigns & Chris Jericho and Kevin Owens in a 3-way tag team match to retain the tag team titles. December 14, 2016 – Tribute to the Troops: Big Cass and Roman Reigns defeated Kevin Owens and Rusev. December 16-17, 2016 – Live Event: Roman Reigns defeated Kevin Owens to retain the United States title. December 18, 2016 – WWE Roadblock: End Of The Line: Kevin Owens defeated Roman Reigns by disqualification to retain the Universal title. December 19, 2016 – RAW: Chris Jericho and Kevin Owens vs. Roman Reigns and Seth Rollins ended in a no contest. December 26, 2016 – RAW: Roman Reigns defeated Kevin Owens to retain the United States title. December 27-30, 2016 – Live Event: Roman Reigns defeated Kevin Owens to retain the United States title. January 2, 2017 – RAW: Roman Reigns defeated Chris Jericho to retain the United States title. January 9, 2017 – RAW: Chris Jericho and Kevin Owens defeated Roman Reigns in a handicap match. Chris Jericho wins the United States title. January 16, 2017 – RAW: Braun Strowman, Chris Jericho and Kevin Owens defeated Roman Reigns, Sami Zayn and Seth Rollins. January 23, 2017 – RAW: Roman Reigns defeated WWE United States champion Chris Jericho by disqualification. Chris Jericho retains the title. January 29, 2017 – Royal Rumble: Kevin Owens defeated Roman Reigns in a no disqualification match to retain the Universal title. Roman Reigns was also in the Royal Rumble match won by Randy Orton. February 11, 2017 – Live Event: Roman Reigns and Sami Zayn defeated Chris Jericho and Kevin Owens. February 13, 2017 – RAW: Roman Reigns defeated The Club (Karl Anderson and Luke Gallows) by disqualification in a handicap match. February 17, 2017 – Live Event: Roman Reigns defeated Braun Strowman. February 20, 2017 – RAW: Karl Anderson and Luke Gallows defeated Roman Reigns by disqualification in a handicap match. February 22-25, 2017 – Live Event: Kevin Owens defeated Roman Reigns to retain the Universal title. March 5, 2017 – Fastlane: Roman Reigns defeated Braun Strowman. March 10-12, 2017 – Live Event: Roman Reigns defeated Braun Strowman. March 13, 2017 – RAW: Roman Reigns defeated Jinder Mahal. March 20, 2017 – RAW: Braun Strowman vs. Roman Reigns ended in a no contest. March 26, 2017 – Live Event: Roman Reigns defeated Jinder Mahal. April 2, 2017 – WrestleMania 33: Roman Reigns defeated The Undertaker in a No Holds Barred match. April 3, 2017 – RAW: Roman Reigns came in the ring and simply said it was his yard and left the ring. April 10, 2017 – RAW: Braun Strowman attacked Roman Reigns while being interviewed. After being put in the ambulance, Braun Strowman amazingly lifted the ambulance with Roman Reigns in it. April 30, 2017 – Payback: Braun Strowman defeated Roman Reigns. May 15, 2017 – RAW: Roman Reigns defeated Finn Balor. May 22, 2017 – RAW: Roman Reigns defeated Bray Wyatt by disqualification. Bray Wyatt and Samoa Joe defeated Roman Reigns and Seth Rollins. May 29, 2017 – RAW: Roman Reigns defeated Seth Rollins. June 5, 2017 – RAW: Roman Reigns defeated Bray Wyatt. June 19, 2017 – RAW: Samoa Joe defeated Roman Reigns. Braun Strowman returned and attacked Reigns, and said they will wrestle at The Great Balls Of Fire PPV in a ambulance match. July 9, 2017 – Great Balls Of Fire: Braun Strowman defeated Roman Reigns in a Ambulance match. July 31, 2017 – RAW: Roman Reigns defeated Braun Strowman and Samoa Joe in a 3-way match. August 7, 2017 – RAW: Braun Strowman defeated Roman Reigns in a last man standing match. August 20, 2017 – SummerSlam: WWE Universal champion Brock Lesnar defeated Roman Reigns, Samoa Joe and Braun Strowman in a 4-way match to retain the title. August 28, 2017 – RAW: John Cena and Roman Reigns defeated Karl Anderson and Luke Gallows. September 11, 2017 – RAW: Roman Reigns defeated Jason Jordan. September 18, 2017 – RAW: Roman Reigns defeated Braun Strowman in a street fight, dark match. September 24, 2017 – No Mercy: Roman Reigns defeated John Cena. September 25, 2017 – RAW: Roman Reigns defeated WWE Intercontinental champion The Miz in a non-title match. October 9, 2017 – RAW: After weeks of feuding with The Miztourage and Sheamus and Cesaro, both common enemies of Rollins, Ambrose and Roman Reigns, officially reunited with Reigns, reforming The Shield. October 16, 2017 – RAW: Braun Strowman defeated Roman Reigns in a steel cage match. Kane returned to the WWE by helping Braun Strowman winning the steel cage match. November 13, 2017 – RAW: The Shield (Dean Ambrose, Roman Reigns and Seth Rollins) defeated Cesaro, Sheamus and The Miz. November 19, 2017 – Survivor Series: The Shield (Dean Ambrose, Roman Reigns and Seth Rollins) defeated The New Day (Big E, Kofi Kingston and Xavier Woods). November 20, 2017 – RAW: Roman Reigns defeated The Miz to win the Intercontinental title. November 27, 2017 – RAW: Roman Reigns defeated Elias to retain the Intercontinental title. December 2-3, 2017 – Live Event: The Shield (Dean Ambrose, Roman Reigns and Seth Rollins) defeated Cesaro, Samoa Joe and Sheamus. December 4, 2017 – RAW: Roman Reigns defeated Jason Jordan to retain the Intercontinental title. December 7, 9, 2017 – Live Event: The Shield (Dean Ambrose, Roman Reigns and Seth Rollins) defeated Cesaro, Samoa Joe and Sheamus. December 8, 2017 – Live Event: Roman Reigns defeated Triple H to retain the Intercontinental title. December 11, 2017 – RAW: Roman Reigns defeated Cesaro to retain the Intercontinental title. December 26, 2017 – Live Event: Roman Reigns defeated John Cena to retain the Intercontinental title. January 8, 2018 – RAW: Finn Balor & The Club (Karl Anderson and Luke Gallows) defeated Jason Jordan & The Shield (Roman Reigns and Seth Rollins). January 12-14, 2018 – Live Event: Roman Reigns and Seth Rollins defeated The Miz & The Miztourage (Bo Dallas and Curtis Axel) in a handicap match. January 15, 2018 – RAW: Roman Reigns defeated The Miztourage (Bo Dallas and Curtis Axel) w The Miz in a handicap match. January 19-21, 2018 – Live Event: The Shield (Roman Reigns and Seth Rollins) defeated The Miz & The Miztourage (Bo Dallas and Curtis Axel) in a handicap match. January 22, 2018 – RAW 25th Anniversary Show: The Miz w The Miztourage defeated Roman Reigns to win the Intercontinental title. January 27, 2018 – Live Event: Jason Jordan & The Shield (Roman Reigns and Seth Rollins) defeated The Miz & The Miztourage (Bo Dallas and Curtis Axel). January 28, 2018 – Royal Rumble: Roman Reigns came in the Royal Rumble match at #28 but was won by Shinsuke Nakamura. January 29, 2018 – RAW: The Miz w The Miztourage defeated Roman Reigns to retain the Intercontinental title. February 2, 2018 – Live Event: Roman Reigns and Seth Rollins defeated Cesaro, Elias and Sheamus in a handicap match. February 5, 2018 – RAW: Roman Reigns defeated Bray Wyatt to qualify for the Elimination Chamber. Cesaro and Sheamus defeated Roman Reigns and Seth Rollins by disqualification to retain the RAW tag team titles. February 12, 2018 – RAW: Roman Reigns defeated Sheamus w Cesaro. February 16, 2018 – Live Event: Roman Reigns defeated Elias. February 18, 2018 – Live Event: Roman Reigns defeated John Cena. February 19, 2018 – RAW: Braun Strowman defeated Elias and Finn Balor and John Cena and Roman Reigns and Seth Rollins and The Miz in a gauntlet match. February 23, 2018 – Live Event: Roman Reigns defeated Elias. February 25, 2018 – Elimination Chamber: Roman Reigns defeated Braun Strowman, Elias, Finn Balor, John Cena, Seth Rollins and The Miz in a 7-way elimination chamber match to become #1 contender for the Universal title. February 26, 2018 – RAW: John Cena and Roman Reigns defeated Cesaro and Sheamus in a dark match. March 3-4, 2018 – Live Event: Roman Reigns defeated John Cena. March 5, 2018 – RAW: Roman Reigns defeated Kane in a dark match. March 12, 2018 – RAW: Roman Reigns called out Brock Lesnar who did not showed up and blame Vince McMahon and got suspended for it. March 17-18, 2018 – Live Event: The Miz defeated Elias, John Cena and Roman Reigns in a 4-way match to retain the Intercontinental title. March 19, 2018 – RAW: Brock Lesnar brutally attacked Roman Reigns. March 23, 2018 – Live Event: Finn Balor, Roman Reigns and Seth Rollins defeated The Miz & The Miztourage (Bo Dallas and Curtis Axel). March 24, 2018 – Live Event: Braun Strowman, Roman Reigns and Seth Rollins defeated The Miz & The Miztourage (Bo Dallas and Curtis Axel). March 26, 2018 – RAW: Brock Lesnar brutally attacked Roman Reigns for a 2nd week in a row. March 30-31, 2018 – Live Event: Roman Reigns defeated Elias. April 2, 2018 – RAW: Roman Reigns seeks revenge toward Brock Lesnar and went after him. April 8, 2018 – WrestleMania 34: Brock Lesnar w Paul Heyman defeated Roman Reigns to retain the Universal title. April 9, 2018 – RAW: Roman Reigns told the WWE fans he has a rematch with Brock Lesnar at the Greatest Royal Rumble. Samoa Joe returned to RAW and said he will face the winner of that match at WWE Backlash. April 27, 2018 – Greatest Royal Rumble: Brock Lesnar defeated Roman Reigns in a steel cage match to retain the Universal title. April 30, 2018 – RAW: Bobby Lashley, Braun Strowman and Roman Reigns defeated Jinder Mahal, Kevin Owens and Sami Zayn. May 7, 2018 – RAW: Finn Balor defeated Roman Reigns and Sami Zayn in a 3-way match to qualify for the Money In The Bank ladder match. May 21, 2018 – RAW: Roman Reigns defeated Kevin Owens by disqualification. Roman Reigns and Seth Rollins defeated Jinder Mahal and Kevin Owens. June 4, 2018 – RAW: Elias and Jinder Mahal defeated Roman Reigns and Seth Rollins. June 8, 10, 2018 – Live Event: Braun Strowman, Finn Balor and Roman Reigns defeated Jinder Mahal, Kevin Owens and Sami Zayn. June 15-16, 2018 – Live Event: Bobby Lashley, Finn Balor and Roman Reigns defeated Jinder Mahal, Kevin Owens and Sami Zayn. June 18, 2018 – RAW: Bobby Lashley and Roman Reigns defeated The Revival (Dash Wilder and Scott Dawson). June 22-24, 2018 – Live Event: Roman Reigns and Seth Rollins defeated Dolph Ziggler and Drew McIntyre. June 25, 2018 – RAW: The Revival (Dash Wilder and Scott Dawson) defeated Bobby Lashley and Roman Reigns. June 30, 2018 – Live Event: Roman Reigns and Seth Rollins defeated Dolph Ziggler and Drew McIntyre. July 2, 2018 – RAW: Roman Reigns and Seth Rollins defeated Dolph Ziggler and Drew McIntyre by disqualification. Bobby Lashley and Roman Reigns defeated The Revival (Dash Wilder and Scott Dawson) by disqualification. July 6, 2018 – Live Event: Braun Strowman, Finn Balor and Roman Reigns defeated Baron Corbin, Elias and Kevin Owens. July 7, 2018 – Live Event: Braun Strowman, Roman Reigns and The Undertaker defeated Baron Corbin, Elias and Kevin Owens. July 8, 2018 – Live Event: Bobby Lashley, Braun Strowman and Roman Reigns defeated Baron Corbin, Elias and Kevin Owens. July 13-14, 2018 – Live Event: Bobby Roode and Roman Reigns defeated Dolph Ziggler and Drew McIntyre. July 15, 2018 – Extreme Rules: Bobby Lashley defeated Roman Reigns. July 16, 2018 – RAW: Roman Reigns defeated Drew McIntyre and Finn Balor in a 3-way match to qualify for the #1 contenders match of the Universal title. July 21-22, 2018 – Live Event: Roman Reigns and Seth Rollins defeated Dolph Ziggler and Drew McIntyre. July 23, 2018 – RAW: Roman Reigns defeated Bobby Lashley to become #1 contender for the Universal title. July 27, 2018 – Live Event: Roman Reigns and Seth Rollins defeated Drew McIntyre and Jinder Mahal. July 28-29, 2018 – Live Event: Finn Balor, Roman Reigns and Seth Rollins defeated Baron Corbin, Drew McIntyre and Jinder Mahal. August 4-5, 2018 – Live Event: Roman Reigns and Seth Rollins defeated Dolph Ziggler and Drew McIntyre. August 6, 2018 – RAW: Roman Reigns defeated Baron Corbin. August 10-12, 2018 – Live Event: Roman Reigns defeated Dolph Ziggler by disqualification. Ziggler retains the Intercontinental title. 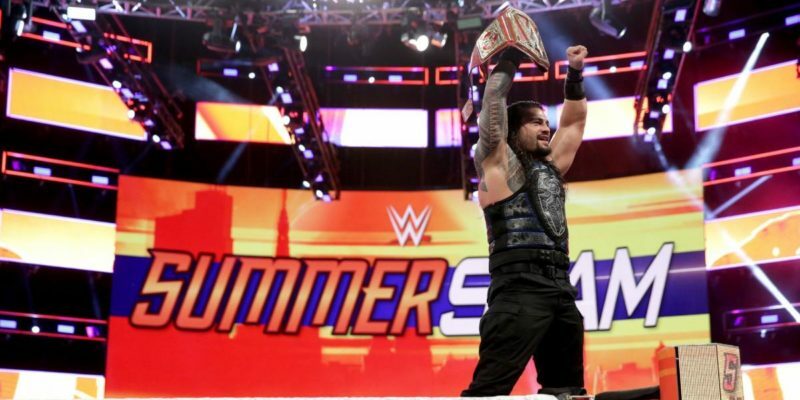 August 19, 2018 – SummerSlam: Roman Reigns defeated Brock Lesnar w Paul Heyman to win the Universal title. August 20, 2018 – RAW: Roman Reigns defeated Finn Balor to retain the Universal title. Braun Strowman tried to cash in the Money In The Bank but was interrupted by the returning The SHIELD and got triple powerbombed true the table. August 27, 2018 – RAW: Braun Strowman and Roman Reigns defeated Dolph Ziggler and Drew McIntyre by disqualification. September 7-9, 14-15, 2018 – Live Event: Roman Reigns defeated Braun Strowman by disqualification to retain the Universal title. September 10, 2018 – RAW: Roman Reigns brings the fight to Braun Strowman. September 16, 2018 – Hell In A Cell: Roman Reigns vs. Braun Strowman in a Hell In A Cell match ended in a no contest, when Brock Lesnar destroyed both wrestlers. Reigns retains the Universal title. September 17, 2018 – RAW: Roman Reigns calls out Brock Lesnar but gets Braun Strowman instead. Roman Reigns defeated Baron Corbin in a no disqualification match to retain the Universal title. September 24, 2018 – RAW: Dean Ambrose gets an offer to join Dolph Ziggler team as Ziggler wants him to join them. The Shield (Dean Ambrose, Roman Reigns and Seth Rollins) defeated Baron Corbin & The Authors Of Pain (Akam and Rezar). October 1, 2018 – RAW: WWE Universal champion Roman Reigns defeated Dolph Ziggler in a non-title match. October 6, 2018 – Super Show Down: The Shield (Dean Ambrose, Roman Reigns and Seth Rollins) defeated Braun Strowman, Dolph Ziggler and Drew McIntyre. October 8, 2018 – RAW: Braun Strowman, Dolph Ziggler and Drew McIntyre defeated The Shield (Dean Ambrose, Roman Reigns and Seth Rollins). October 15, 2018 – RAW: The Shield (Dean Ambrose, Roman Reigns and Seth Rollins) defeated Braun Strowman, Dolph Ziggler and Drew McIntyre. October 22, 2018 – RAW: Roman Reigns makes a shocking announcement that he has leukemia and has to relinquish the WWE Universal title, he also says he will be back soon. February 25, 2019 – RAW: Roman Reigns returned to Monday Night RAW and announced that he is in reminiscing from leukemia. Seth Rollins & Roman Reigns saved Dean Ambrose from a 3-1 beat down. March 4, 2019 – RAW: Roman Reigns wanted to re-form the Shield which happened and they will have one last match at WWE Fastlane. 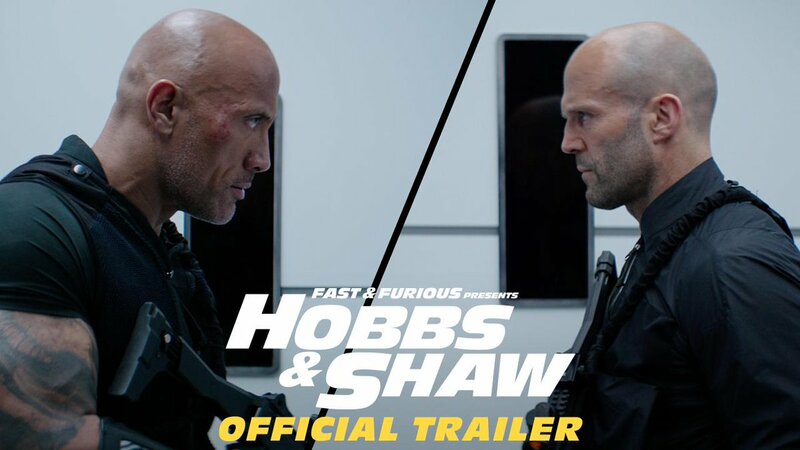 March 10, 2019 – Fastlane: The Shield (Dean Ambrose, Roman Reigns and Seth Rollins) defeated Baron Corbin, Bobby Lashley and Drew McIntyre. March 11, 2019 – RAW: The Shield delivered a farewell speech. Roman Reigns vs. Baron Corbin never got started as Drew McIntyre attacked Reigns.